After playing with a few IoT related devices and scenarios, I wanted to finally enable IPv6 in my home network. After looking if my ISP (NET Virtua) was already supporting IPv6, I was happy to find out that they were already claiming that my city (Florianópolis) was covered, so I decided to give that a try (and post my setup/experience). I’m using Netgear R7000 as my main router, simply because it’s known to be well supported by DD-WRT. 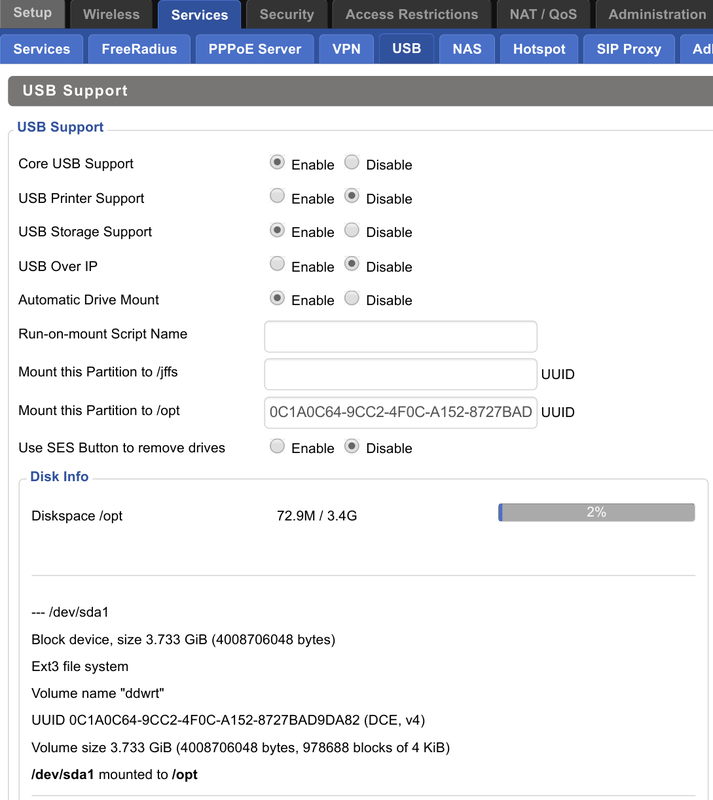 Installing DD-WRT on Netgear R7000 is quite an easy job, and there is also an huge list of links covering several useful tips at http://www.dd-wrt.com/phpBB2/viewtopic.php?t=264152, which is quite handy (overclocking, QoS, installing Tor, etc). I first configured my IPv4 network to use DNSMasq for both DHCP and DNS. Being able to use DNSMasq is great because it is quite easy to configure, besides supporting the IPv6 Router Advertisement feature, which is quite handy for my own IPv6 network (no need for radvd). Then I just enabled IPv6 by going to the Setup->IPv6 tab. 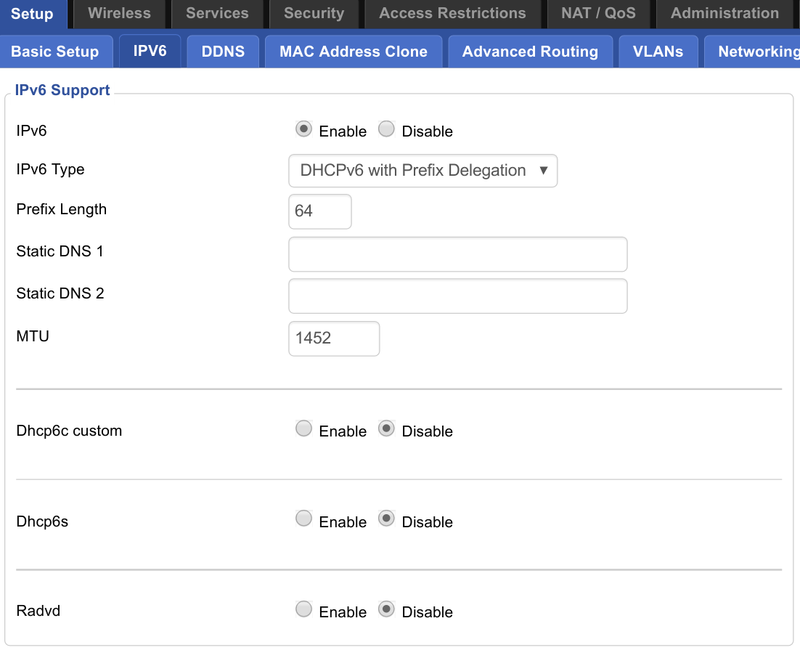 I’m using DHCPv6 with prefix delegation since that is supported by my ISP, making it even easier to configure my own network. 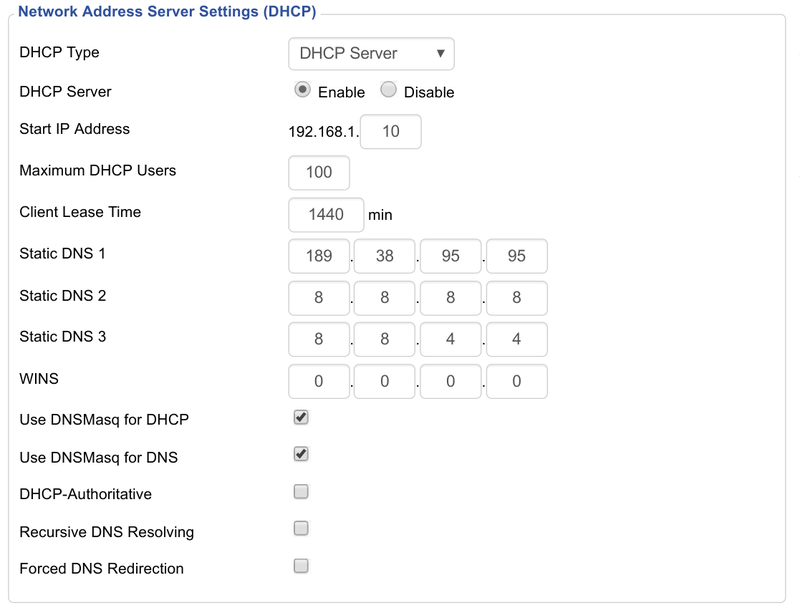 Since I’m using DNSMasq for DHCP, I can safely disable radvd, but an additional step is required (custom DNSMasq config). 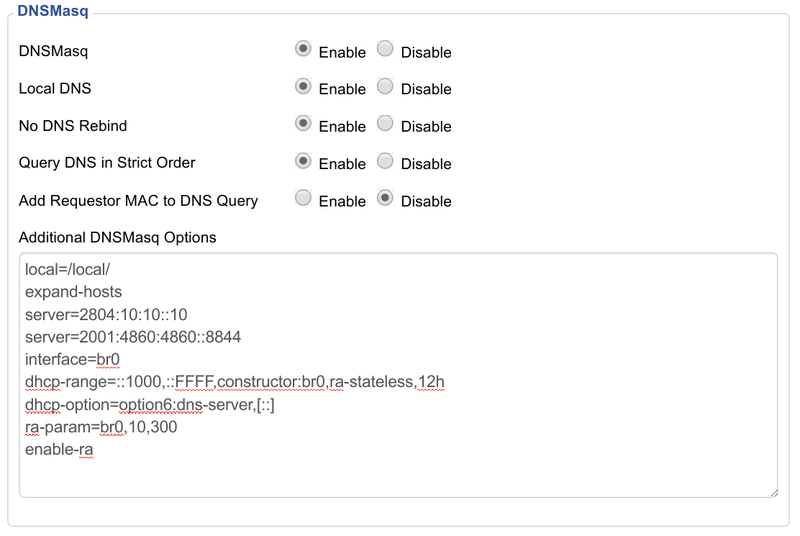 To configure DNSMasq just go to the Services->Services tab, and you will find a field that can be used to store your custom config entries. For a complete overview and description of the supported options, please check http://www.thekelleys.org.uk/dnsmasq/docs/dnsmasq-man.html. In my case, all I needed was to define define the dhcp-range, dhcp-option, ra-param and enable-ra options. Nice, easy and working as expected! Unfortunately life it’s not always that easy and simple, something wrong was happening that made my IPv6 network to die completely after a few minutes, but it was always functional after rebooting my router. Tried the same ping6 commands from both my notebook and router, but all I got was that my IPv6 network was down. Time to get my hands dirty and debug! Good, that was it, now to understand why my default route disappeared. So the ISP router is sending the required RA message, but only after the initial RS message that is sent by my router when establishing the connection (simulated by bringing the interface down and up). The lifetime interval also gives a hint to why my IPv6 network is only working for a few minutes after booting my router (30 minutes in this case). Unfortunately there is really not much that can be done from the client side, as my ISP’s router is really not helping much here. One possible workaround could be forcing a default gateway after booting my router, but that is not really a good solution as the address might change after a while. After investigating a bit more, I decided to try to periodically send RS messages by hand (even if not really recommended by the spec), so I could get the desired RA messages that would be used to update my default gateway route. Luckily there is already a tool called rdisc6 (from http://www.remlab.net/ndisc6) that can be used to send RS messages from the command line, but unfortunately that is not available by default in the DD-WRT build I used, so time to install the tool by hand. Once nice thing about using Kong’s DD-WRT builds is that you can use the bootstrap command to enable additional OPKG repositories, allowing the user to extend the image with custom packages. After checking Kong’s OPKG repo, I was able to confirm that the rdisc6 was already available as package, so all I needed to do was to install the extra package, which is great! Make sure to mount the disk into /opt, otherwise the bootstrap script will fail to run (first enable core USB and USB storage support, reboot, add the partition UUID and reboot again). Found a valid partition: /opt. Bootstrap complete. You can now use opkg to install additional packages. And now to finally test my theory let’s open tcpdump while we manually send the RS message, to check if the default route gets updated once it gets the RA message from my ISP’s router. Lovely, RS message sent with help from rdisc6, RA message replied back from the ISP router and default route updated. With that in place I can safely reboot my router and get a stable IPv6 network setup (until my ISP improves/fixes their infrastructure). Obrigado por este instrutivo artigo. Eu tenho em minha casa um roteador DIR-868L HW-B1 rodando DD-WRT v3.0-r29519. Recebi da NET um modem PACE C6500 com docsys 3.0 e o coloquei em modo bridge. Utilizando as configurações que você descreveu, os DNS ipv4 e ipv6 deixaram de responder e não obtive ipv6 global nos clientes, apesar de conseguir resposta com o ping6 2001:4860:4860::8844. Esqueci de mencionar que a resposta de ping6 só chega via telnet. Igor, no seu caso parece que o ra daemon (no caso do meu artigo, dnsmasq) está rodando na interface vlan2 ao invés de br0 (veja minhas configurações do dnsmasq, linha ‘interface=br0’). Você está com uma conexão ipv6 válida, porém agora só falta expor para a interface da sua rede interna. O ra daemon é o responsável por dizer a subnet e a rota padrão, e os clientes definem seus próprios ips. Obrigado por responder meu questionamento. Minha configuração do dnsmasq está identica à sua, inclusive a linha “interface=br0”, mas o endereço global aparece apenas na interface vlan2! Eu tentei configuração abaixo com RADVD (desabilitando dnsmasq), e a interface br0 continua sem ipv6, entretanto os clientes conseguiram definir seus IPs globais, sem acesso a internet. This work is licensed under a Creative Commons Attribution-Share Alike 2.5 Brazil License.